"Showcasing healthy & delicious recipes of 25 minutes or less, created by ordinary people across the globe!" CALORIE COUNT: 243 Calories Per Serving; SERVING SIZE: 64 grams. Preheat your oven to 350° F.
Next, mix all of the Cream Pie ingredients together in a blender or food processor. Bake in the oven for 13 minutes; while the Cream Pies are baking, mix together your Frosting ingredients by hand in a small bowl. When Cream Pies are done, remove them from your muffin tin or cookie sheet; next, add “cream” to one side of Cream Pie, and make sandwich with the other; Serve immediately, or refrigerate for a later date. Thanks Maria & Sav for sending in this wonderful arrangement to Tasty25 Magazine! What’s your Tasty25 creation? Send in your recipe, and be featured on Tasty25 by going to the “Submit Your Tasty25 Creation” page. CALORIE COUNT: 70 Calories Per Serving; SERVING SIZE: 15 grams. Line a large baking dish with aluminum foil. In microwave-safe glass bowl, combine chocolate chips and peanut butter; Microwave on HIGH for 1 minute. Stir in marshmallows and Bran cereal and pour mixture into prepared dish; smooth the mixture out to cover the bottom of the dish. 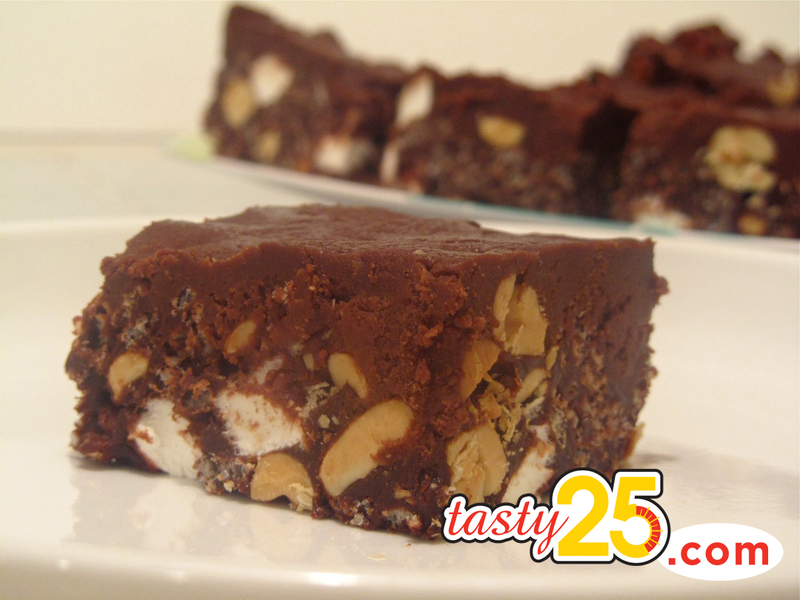 Refrigerate until mixture hardens; Then lift foil from dish and place Rocky Road on a flat surface. Thanks Lilian for sending in this wonderful arrangement to Tasty25 Magazine! What’s your Tasty25 creation? Send in your recipe, and be featured on Tasty25 by going to the “Submit Your Tasty25 Creation” page. 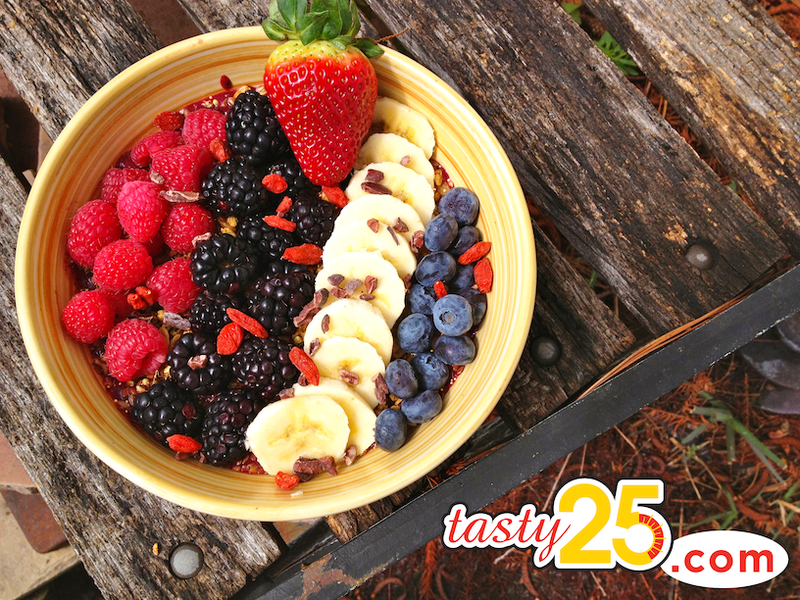 5-Minute Açaí Super Foods Bowl! Quick Fact: Anthocyanins and flavonoids are powerful antioxidants that help defend the body against life’s stressors, and the açaí berry is full of them! They also play a role in the body’s cell protection system. Free radicals are harmful byproducts produced by our bodies; eating a diet rich in antioxidants lessens the destructive power of free radicals, and may help reduce the risk of some diseases, such as heart disease and cancer! CALORIE COUNT: 298 Calories Per Serving; SERVING SIZE: 219 grams. Take a medium-sized glass bowl, and stick it in the freezer to remain cold during the preparation process. Choose your toppings (OPTIONAL), and wash/prepare them; Set aside for later. 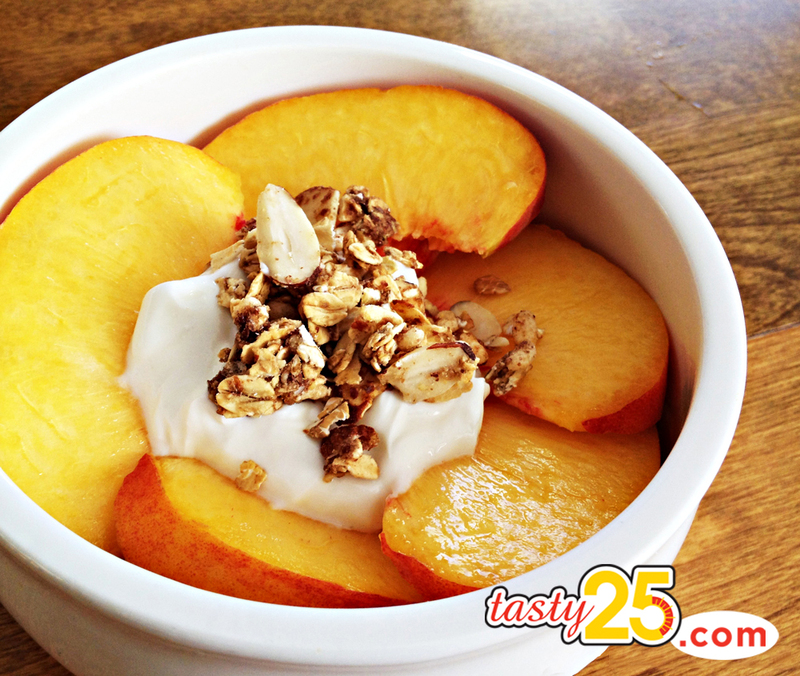 Now remove your glass bowl from the freezer, and spread 1/4 Cup of granola evenly into the bottom of the bowl. Finish the recipe by topping with the additional 1/4 Cup of granola, adding your optional fruit & seed toppings! What’s your Tasty25 creation? Send in your recipe, and be featured on Tasty25 by going to the “Submit Your Tasty25 Creation” page. Amber Constant is a Tasty25 Magazine contributor from New Orleans, LA. Mix all of your dry & wet ingredients together in a medium-sized bowl. Fill 8 cupcake liners evenly with your cupcake mix, and place the cupcakes on a flat cooking pan. Place cupcakes in the oven for 8-10 minutes on 375 F°; remove from oven when cupcakes are golden brown. Thanks Mirela for sending in this wonderful arrangement to Tasty25 Magazine! What’s your Tasty25 creation? Send in your recipe, and be featured on Tasty25 by going to the “Submit Your Tasty25 Creation” page. 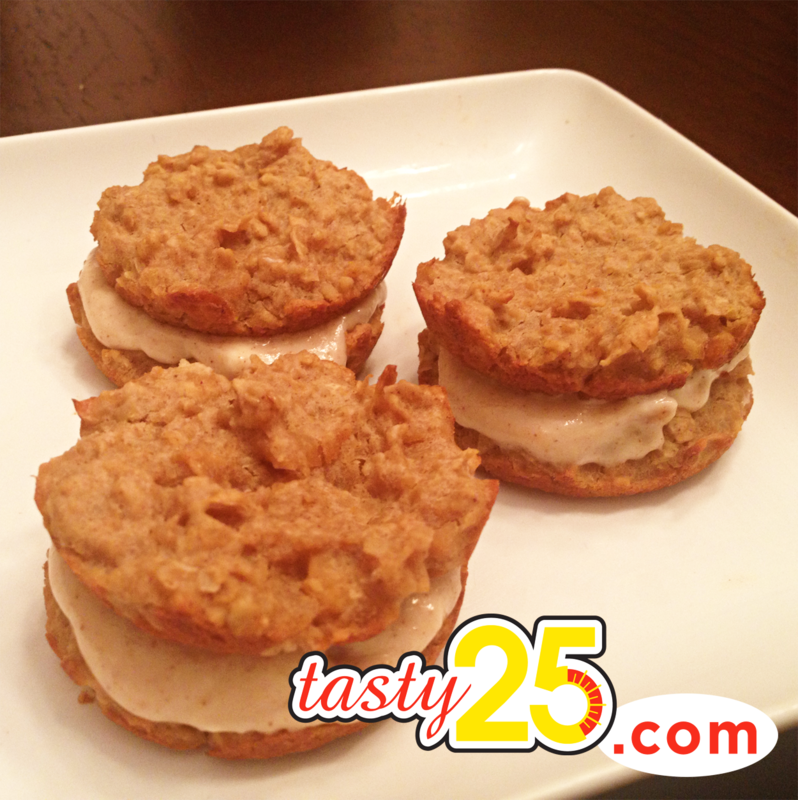 Tasty25 TV: Autumn Harvest Cookies! 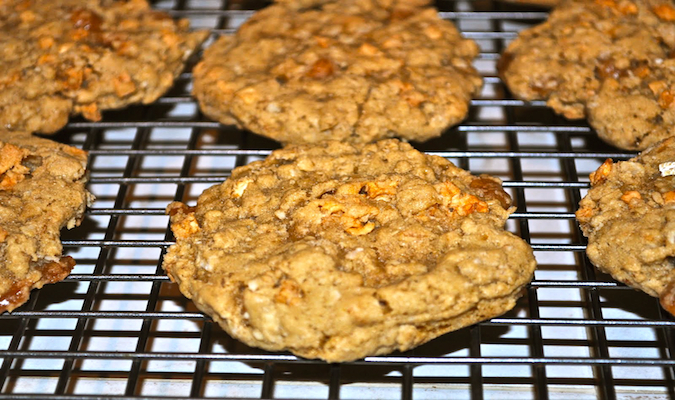 Combine your flour, oats, baking powder, baking soda, and salt into a large bowl; Stir well. Next, place your honey & butter into a large bowl; beat with a mixer at medium speed until light and fluffy; Add your vanilla and egg, and beat well; Gradually add the flour mixture to the bowl, and beat at low speed until mixture is just combined; Then gradually fold in your chopped apple slices and the bits of caramel. After you’re finished combining the ingredients, drop the dough by 2 teaspoonfuls two inches apart onto baking pans lined with baking paper. Flatten balls slightly with your hand, and bake at 350 °F for 9 minutes. When cookies are done, cool the cookies in the pans for about 3 minutes. Then remove cookies from pans, and allow to cool completely on wire racks. Thanks Reese for sending in this wonderful arrangement to Tasty25 Magazine! What’s your Tasty25 creation? Send in your recipe, and be featured on Tasty25 by going to the “Submit Your Tasty25 Creation” page. Quick & Easy Peaches ‘n Cream! Slice peach in the middle all the way around, twist to separate into two halves. Remove pit and cut into slices. Top slices with greek yogurt, and sprinkle with honey almond granola (along with nuts; optional). Thanks Fabby for sending in this wonderful arrangement to Tasty25 Magazine! What’s your Tasty25 creation? Send in your recipe, and be featured on Tasty25 by going to the “Submit Your Tasty25 Creation” page. 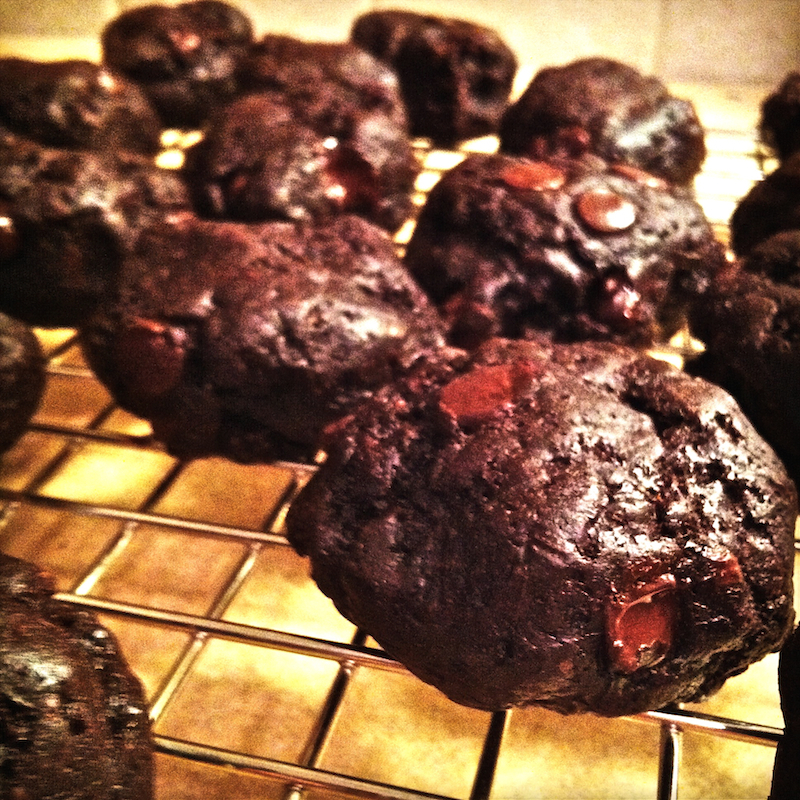 “Believe It Or Not” Healthy Double Chocolate Cookies! Grind the almonds into a fine meal using a food processor or Magic Bullet. In a large bowl, whisk together almond meal, cocoa powder, and baking soda; Using the food processor, blend your avocado, vanilla, raisins and egg until smooth. Next, combine wet ingredients into the dry mixture; Mix until incorporated evenly. After mixing ingredients evenly, add your dark chocolate chips and stir until evenly distributed. Thanks Kelynn for sending in this wonderful arrangement to Tasty25 Magazine! What’s your Tasty25 creation? Send in your recipe, and be featured on Tasty25 by going to the “Submit Your Tasty25 Creation” page. Submit Your Tasty25 Recipe Creation!